Michał Kwiatkowski has attacked after the top of the Taaienberg with 33km to go, Peter Sagan followed immediately and Sep Vanmarcke bridged across moments later. A long range move with both Sagan and Vanmarcke taking a big risk given they had no team mates behind but they were going to stay away. This was the moment the race was won. The first attack of the day came from the Topsport Vlaanderen team, who else. But try as they might no move could go clear until almost two hours of racing had passed. This first phase of the race can last seconds as the peloton consents to letting the first move go, sometimes it can take two hours and the longer it goes on the more riders will set new high scores on their power meters. All this action, all those calories only to make the day’s doomed breakaway? Maybe but two of the fugitives were going to stay away all day and make the top-10, proof that the tactic can pay off. The hectic start put the race ahead of schedule until finally the peloton decided a pee stop was needed and the move got away. It’s not often reported but that’s often how it works, there comes a point where the top riders have to pull over for a leak and this encourages others to do the same and a critical mass of urinators allows the breakaway to go clear. The nature break was brief and over the following kilometres a series of crashes took out riders. Arnaud Démare and Tiesj Benoot were among the early victims but there were too many to name. Sep Vanmarcke crashed but continued, albeit on a replacement bike which he’d later use up more energy when he demanded to swap bikes as he wasn’t comfortable. Later on a Bora-Argon 18 rider allided with BMC Racing rider causing a wave that crashed into an inconsolable Greg Van Avermaet, reportedly out with a broken collarbone. The race split over the Molenberg with 118km to go and Etixx-Quickstep put Tony Martin to work. Cancellara made the right side of the split but his Trek-Segafredo team hadn’t and they led the chase back in order to surround their leader with his lieutenants, a move that was going to prove essential later on. From here the race was in a state of flux, a posh way of saying nobody had a clue what was going on. The race was split into pieces and there were not enough cameras on motorbikes and helicopters to cover who was where and what the time gaps where. Among the big names Ian Stannard had slipped the peloton and Etixx-Quickstep were trying to get tactical control of the race by sending Stijn Vandenbergh up the road. The lead break was reshaped as Imanol Erviti (Movistar) and Gus Van Hoeke (Topsport) of the early move were joined by Dimitri Claeys (Wanty-Groupe Gobert), Dmitriy Gruzdev (Astana) and Nils Politt (Katusha), one of the quiet revelations of the spring classics, plus André Greipel on one of his regular spring outings in the spring classics and they lead the race into the Koppenberg. The bunch split apart on the Koppenberg, a 20% slope is hard any day but after 210km tougher and then add cobbles and it always seems to provoke a selection, more so since some were caught in traffic and forced to run up, the timeless image, including Filippo Pozzato, comically tipped by some to win, now click-clacking up the cobbles in his cleats. The Steenbeekdries and the Taaienberg kept the race split apart but after Nukerke things gradually began to regroup. Ian Stannard was caught and the Sky riders began to talk. Who would be their next rider to attack? Their classics race plan has revolving attacks, no sooner is one rider caught than another goes: now it was Kwiatkowski’s turn. Sagan followed instantly and Vanmarcke barged across. Kwiatkowski’s move was bold but prompted, in part at least, by Team Sky’s presence at the main group, they had several riders. But for Sagan and Vanmarcke this was a much more risky prospect as they’d now committed to a move and exposed themselves early and had little or no help from their team mates in case things went wrong while Kwiatkowski could work or sit on. Behind Stijn Devolder took a long pull and looked over for Cancellara to come through but was it too early? Would Cancellara just end up towing others across? The time to pose these questions and think through the answers and the Kwiatkowski-Sagan-Vanmarcke trio had twenty seconds. As the minutes went by Cancellara began to look like a passenger in a taxi stuck in traffic knowing he was going to be late for a meeting while being forced to watch the meter rack up. Trek’s riders worked but struggled to pull back the trio who caught the lead breakaway with 20km to go. Help from Astana and Katusha arrived and brought the gap down from 30 seconds to 20 and this changed plenty. 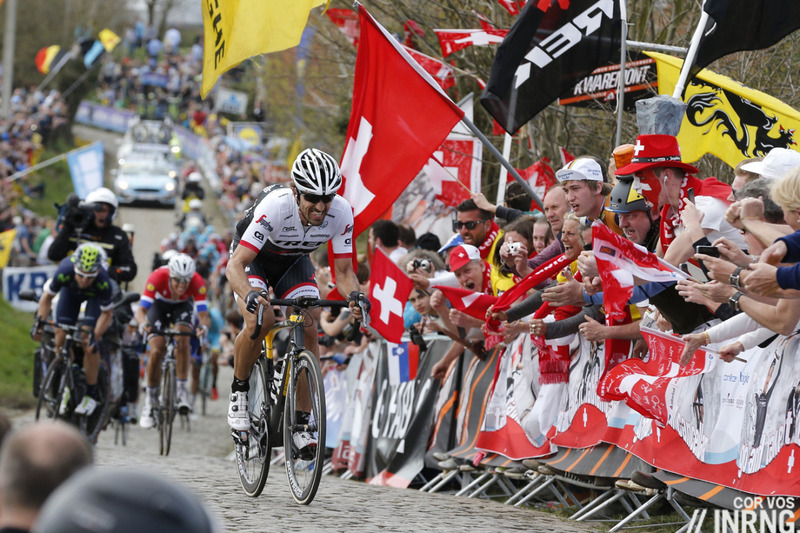 It meant Cancellara and company had the leaders in their sight on the Oude Kwaremont. It’s a long climb out of Kwaremont and Cancellara got to work on closing the gap and soon Vanmarcke and Sagan had just 10 seconds. Kwiatkowksi, the instigator of the move, began to wilt on the Kwaremont. On to the Paterberg and Sagan and Vanmarcke had a ten second lead over Cancellara and Terpstra. This was a role reversal with Peter Sagan riding as we might have expected Cancellara to ride, the Slovak was leading when we might expect him to track others and win from the sprint. 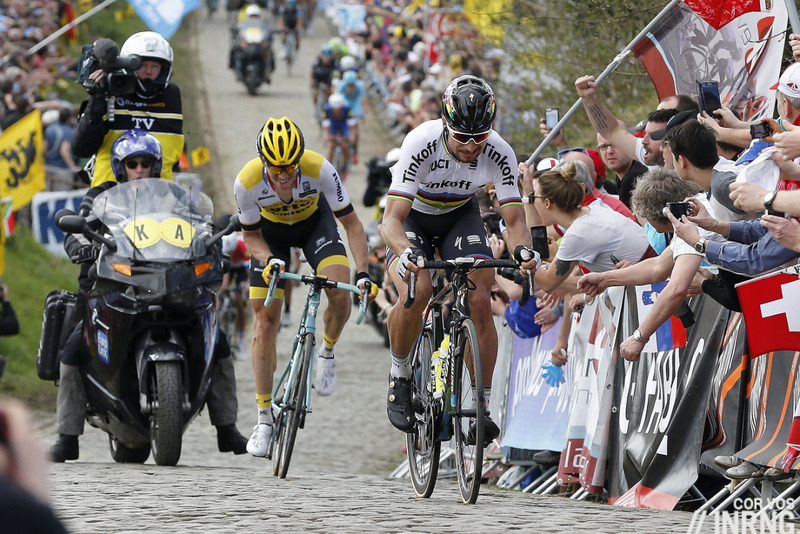 With only Sep Vanmarcke left Sagan accelerated on the steepest part of the final climb. It was barely an attack, after all if the pair came together to the finish surely Sagan would win in a sprint? Foresight said so. Hindsight confirmed it as Vanmarcke suddenly came undone, his forceful style suddenly looking clumsy as he grimaced and was forced to stand on the pedals. In the space of a few metres a significant time gap had opened up. As such this wasn’t the winning move since Vanmarcke beginning to cramp, this was the coup de grace and the exhibition. Sagan was away. Behind Cancellara surged away from Terpstra and got Vanmarke but the Belgian was hardly a prize catch. The pair took turns only the Swiss’s efforts were longer and more applied, as if Vanmarke knew he could assure himself of a podium finish but could not contribute much more. Cancellara got his second place and waved goodbye to the crowds with Vanmarke rolling in behind and then Alexander Kristoff took the sprint for fourth place. The race ended as predicted yet it it was the manner of the racing that made it so appealing. Last year’s winning move went early when Kristoff and Terpstra slipped away with 26km to go over the Hotond climb. This time it was seven kilometres earlier. Three of the top four contenders in Sagan, Vanmarke and Kwiatkowski took off with the remaining pick Cancellara in pursuit. For Sagan and Vanmarke this was bold given they had the least amount of team support with them, committing early to a move. It was far superior to Sagan’s world championship win, a powerful and skilful move but a late one, this was more audacious to start with and concluded in authority nobody could bring him back. The two triumphs married together as Sagan achieved the rare feat of winning De Ronde in the rainbow jersey, the only men to have done so are Tom Boonen (2006), Eddy Merckx (1975), Rik Van Looy (1962) and Louison Bobet (1955). With hindsight Cancellara should have gone with the Kwiatkowski-Sagan-Vanmarke move but at the time it wasn’t obvious: other teams had numerical superiority and there was a still a breakaway up the road and if he’d gone and done the work then Sky could have countered him. Astana, Katusha and Etixx-Quickstep all had a lot of riders in the mix too in the final half hour of the race but couldn’t profit from this. Etixx at least tried to get control of the race, at first with Tony Martin pushing the pace and later with Stijn Vandenbergh but they didn’t have the captains to back it up, Zdeněk Štybar and Tom Boonen were hard to spot and Niki Terpstra could only try to chase Cancellara late in the race. Years ago Quickstep were sponsored by Specialized and the bike sponsor sent them a young Slovak mountain biker for tests, you can guess his name. “They were very good tests and even more, he turned up without shoes or a bike” said the team boss Patrick Lefevere. “The problem was that he only spoke Czech [sic] and wanted to focus on mountain biking and, above all, he wanted money. But he was only 18 years old.” Sagan is now 26, what chance of a reunion with the Belgian team for 2017? Sagan rode as he did as a neo-pro with that careless air of a rider who doesn’t know his limits. As good as the race was there’s more to come, an air of revenge for Cancellara perhaps. This time next week we will know the winner of Paris-Roubaix and the cobbled classics will be over another year. What a race and what a worthy winner. Sagan is a breath of fresh air in both his attitude to racing – you race and attack to win, and his outgoing personality. For too long we have endured the set piece scenarios where taking the initiative too far out has been considered irresponsible, even in one day races. One somehow suspects that the DSs have little influence on such a born racer. That a rider seizes the moment and takes the race by the scruff of the neck in order to WIN is something special. Cancellara’s performance is deserving of note, but he lost because Sagan was the better rider, took his chance when others dithered and wanted the win. Can Roubaix match this ? I think it was so important for Sagan not just to win a monument, but to win against Cancellara before he retires. The last 10km, even though there was a 20 second gap, was really mano-a-mano and Sagan won. 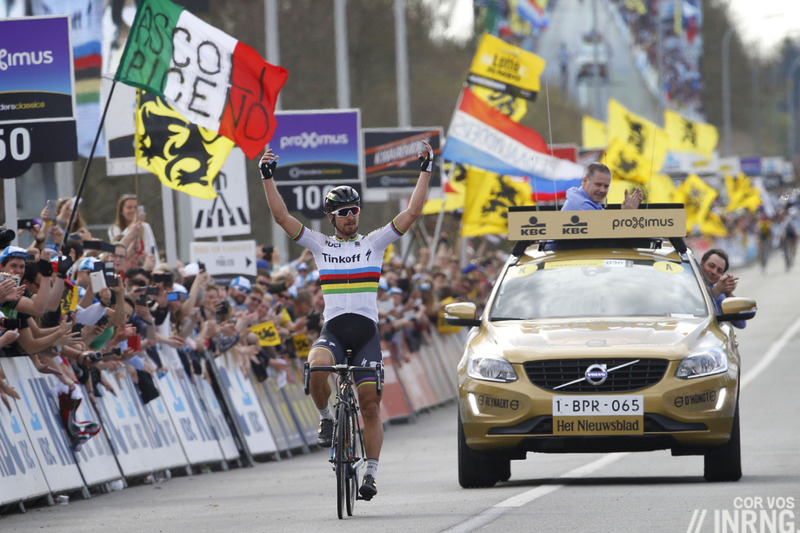 Also, we know pro cycling often serves up farce, but today it delivered poetry with both rainbow jerseys winning. Agreed – was great to see Sagan win against the best when the best was in his top form (or as close to his top form as we could expect). What a great race. That mano-a-mano chase in the final 10-12 km was unbelievable. Can’t wait to rewatch that. Great race this year. Vanmarke showed class in allowing Cancellara to get 2nd uncontested and wave goodbye to the race. The king is dead, long live the king. Totally agree with you ! A great winner in an audacious move, a battling second and a classy third ! A great write-up of a brilliant race with a deserved winner – thanks. I also enjoyed seeing Vanmarcke decide not to contest the sprint for second with Cancellara – letting the great champion cross the line alone was a nice respectful move. Definitely. Cancellara kept his class in defeat and it was classy from Vanmarcke to let him have his moment. Just love this piece, the flow of it is itself like a race. Especially as a bonus Louison Bobet is mentioned and I somehow have a soft spot for both Bobets. Sometimes a race is a blur on hindsight: A wild mix of colours, action and reaction and at one point the winner somehow miraculously emerges at the finish line. Ettix-they look to Boonen, who isn’t Boonen anymore or at least right now). Fabian Cancellara, being aware all the time of the cycling history he was about to write with every turn of the pedals, no matter, if he would win or not. It would be history anyway – either the story of a last glorious win or getting defeated in grace by another of the great ones. It was like some part of himself was watching himself doing it. And of course the look on the face of Peter Sagan when he rode up the Kwaremont. There is a moment, where you can almost hear, how he says to himself: Now! Give it all you got! It was great and very emotional. Am thankful I could be part of it on my TV screen. I love Paris-Roubaix even more, the desperate fields, the nothing of the roads, the land who doesn’t care enough to even open up one eye, just because a few bike riders give their all on it’s surface. 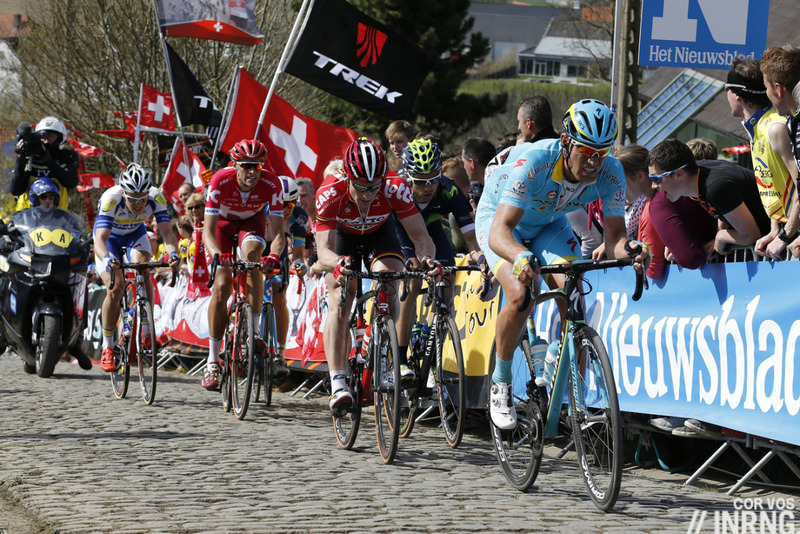 And after the Ronde is the time, where I get excited about Paris – Roubaix and count the days. Thanks again for the lovely piece! Not sure if intended, but for me the top photo spans the width of the entire page on both Chrome for Android and IE on pc. It overlaps with the Recent posts and comments and the top of your Twitter box. Looks good still as a page wide image but the standard website text that is on top of it makes it look off. The comparison of Spartacus to a taxi passenger is great, I enjoyed it very much. I would like to know, if Cancellara’s decision not to bridge to Kwiatek – Sagan – Vanmarcke trio was made purely intuitively (this is too soon with 31 km to go), or if there were other circumstances (I do not feel comfortably enough, let the domestics do more work). He must have understood the danger. Great race, deserved winner, in fact deserved first four. I’m one of those who thought: “Fabian isn’t following Sep, and losing the race right now, there’s too much power in front”. And yet it was the moment when Cancellara lost the race, but not the only moment Sagan won it. He won it too, in the Kwaremont, melting Kwiatkowski, and up the Paterberg, grilling Vanmarcke, and then on the subsequent skilful descent, where he again put time on Cancellara. The best races are rarely won in a single moment. Which is probably one of the best ways to tell good from bad racing. I thought this too when Kwiatkowski attacked:- Sagan looked like he knew that the race was on and Cancellara realised he had to decide there and then if he was strong enough to bridge and still do 30K’s with the target on his back for everyone else to shoot at. Four/five years ago, he could have done it and, as he later admitted, was also banking on Sagan to falter late on. It didn’t happen and it felt like the changing of the guard on the Paterberg as the pair matched each other but Cancellara couldn’t close the gap. Really pleased for Sagan – he should go on and win a hatful of monuments now, injury and illness permitting. He’s learnt the hard way how to measure his efforts and manage things allied to his balls out mentality. Loved his quote at the end on interview. Great race, but somewhat confusing at times to try and pick apart. Eurosport commentary and poorly time ad breaks didn’t help!! Great write up as per usual. Though I think it was clear that everyone was marking Cancellara. They knew he was on good form and that he would, sooner or later, make a break. In fact, I think it looked like so many teams were waiting for his ‘winning move’ that the there was the danger that the break might stay away. In the end I think Sagan exploited that weight on Cancellara, whose pedal stroke seemed more laboured under the expectation. Cancellara’s ‘tears’ at the end demonstrating the emotional toll. Flanders – the Classic that doesn’t disappoint. even though Cancelara went full gas up the last two climbs he didn’t go faster up than Sagan + Sagan did the majority of work in the Kwiatovsky/ Vermarcke group. He was just faster and outounched the Swiss on the cobbles. Nah, the jersey needs a myth! May it be curse or luck, that’s not important. It’s the myth that counts. And in a cycling race it happens more often that a rider loses than wins and so in this case it is the “curse”. Probably more the curse of expectations, because the rainbow (which is no rainbow) is so visible. What a race. Sagan deserved the win. Felt sorry for Spartacus. On any other day under different circumstances (Vanmarke not chasing to get back to the peloton and wearing himself out, the rest of the Trek team not chasing to get back to the peloton and wearing themselves out) he would have been in the mix at the finish. At the same time the results of Sagan’s winter training regime are evident. In the run into the finish he effectively out tt’d an all time great. Add to this a sensitive victory dedication. I will enjoy his continued lighting up of the peloton. Surely he will enjoy the level of success of Boonen, Spartacus et al. A class apart. Honourable mention must go to Vanmarke sitting up at the finish. He knew he was overcooked and therefore of no use to Fab Fab. A great show of sportsmanship. Fabulous write up inrng as ever. Here’s to P-R! +1 “Felt sorry for Spartacus.” I know what you mean, but if you want to get over it just think how disgusted he would be if he found out. Very good write up. Thanks. As I was watching Saga solo to victory I felt that I was watching a gemuinely legendary performance. The kind of ride we will look back in years to come as very special. Was I right? I think you are right unless Sagan repeats this performance a few more times and it becomes just one of many performances. The way he distanced Vanmarcke on the Paterberg – or rather the way Vanmarcke was suddenly cooked – and then solo-ed to victory against Cancellara/VM reminded me of the classic 2010 performance where Cancellara rides away from Boonen on the Muur van Geraardsbergen and on to victory on the ‘old’ parcours of the Ronde. I was also thinking that Cancellara should have tried to match the Sagan/Kwiato attack – but indeed, whether a quartet with also Vanmarcke would have worked together and been allowed to stay away is one of those ‘what ifs ‘that is now irrelevant – we can see where the race was lost by some, but not how it would have been won otherwise. Thank you for your response. It’s an interesting perspective to consider the context his future performances might provide to yesterday’s win. If I read you right, you’re saying that if he wins lots more monuments we can look back on this win as the start of a golden era, but that it will be seen as less special. Whereas, if this year’s Ronde proves to be a promise unfulfilled then we will celebrate this win as a being a classic, although perhaps tinged with a hint of what could have beens. In a sense, less could be more. That’s a thought provoking angle. I think the image of him soloing to victory in the WC bands will live long as an iconic image. Such a dominant and assured victory. One particular moment had me thinking the same thing: A few kilometers out, a cycle path ran parallel to the road, and Sagan glanced over at as he passed a recreational cyclist. It was so casual–something I’d do while out on a jaunt–but Sagan was in the midst of a flat-out race to the finish. Yep, that’s it. Made me laugh out loud. I got a kick out of that live, but I just watched it again. That guy is wearing a full-on wool Eddy Merckx Molteni kit with matching bike, black number plate…seems he was on a mission! That was really something. Can you believe it: riding full gas, with the eyes of the world on you, trying to stay away from the best riders in the world and you look casually over your shoulder at a fan next to the road as if it is a Sunday afternoon club ride. This guy has a totally different mental approach to the whole celebrity-in-sport- thing and I appreciate that he is showing awareness/appreciation of the world around him (even learnt English) – even though there is probably nobody who can pedal a bike like him in the world right now (nobody wants to work with me, so best to drop everybody). Can we now put to rest now the tedious repetitions of “Sagan is a poor tactician?” At the top of the Paterberg with 13km to go and only an 18 second lead, he was faced with a choice: go on alone and risk spending a lot of energy before getting caught by the Cancellara-Vanmarke duo, or wait for them and rely on his superior sprint. Had he been caught, as seemed very possible before it became clear that Vanmarke had little to give in the chase, they would naturally not have collaborated with Sagan, increasing the risk of being caught by the third group. This was also the risk of waiting for them at the top of the Paterberg. As Sagan said right after his victory, “nobody wants to work with me.” He took a risk and won solo, but it was smart tactics. Sprints, even 3 up ones, have an element of lottery about them. You could mistime it, slip a gear or just be outsmarted or boxed in. When you are so superior to everyone, as Sagan is right now, theres no point chancing it. exeactly – Sagan would win 9/10 sprints against Kwaitkovsky but lost E3 bacause kviatkowsky went the nanosecond Sagan had finshed looking over his shoulder. I think this race, and his win in G-W are proof that Sagan is finally becoming the tactician he needs to be in order to win the biggest races. In both he used his power when needed rode cannily and made sure he was in the right position. I think earlier in his career he benefited from both his huge strength and novelty as a rider (someone who can win in sprints, classics and in the hills), but quickly other teams wised up and refused to help him in moves or just worked against him. I too thought his ride was Cancellara-esq, and if you’re the marked man you have to be both stronger and smarter than your rivals. His 2015 world’s win was a matter of pure watts – Sagan could lay down more of them than anyone else after that many kilometres. The Ronde was a far more impressive win, and it shows he’s been learning from past misjudgements and confidence. Sagan has been a poor tactician in the past (and has been on sub-par teams to be fair), those days do look to be over. I don’t know that his Worlds win was “pure watts”. He put the most amount of time into people when he WASN’T pedaling. He recognized an opportunity that matched his skill set and used it to his advantage. Exactly, Sagan’s World’s win wasn’t pure watts at all. That was 1000% tactics and cold-blooded descending. He attacked fiercely up the final climb, but buried everyone else on the descent. That was pure genius – Sagan knows that no one can descend like he can and he knows that it wasn’t a given that he could outsprint Matthews, Gerans, etc. so he had to drop them to win. He finally figured out how it works. He let Kwiat ‘have’ E3, and now had the favour returned by Kwiat in pulling at Mariaborre. Mind you, it’s not a bad thing. ‘Combines’ are as much a part of this sport as wheels are part of a bike. That’s what the retired professional rider who lives round the corner from me reckons as well. He’s got a conspiracy theory that help in the Ronde was payback for E3. Like Sagan and Kwiato are forming a private World Champions alliance. Maybe that’s why Geraint Thomas seems a bit miffed about how his team’s tactics played out behind Kwiatovski’s attack, which was so decisive pin putting Sagan up the road. What did thomas say, link? Interesting how G carries on about counterfactuals (“could have” handled Sep, but could not (in fact) hold Fabian’s wheel), without blaming “Kawasaki” directly for anything that actually happened. He says he “should have” been in the move that Kwiatkowski was in, but why was he not? Bad decision from the car? Because the Pole and the Slovak got rolling before anyone had time to issue orders? Bad tactics, superhero alliances, who knows? Should say this is not about Geraint Thomas, but I am interested in knowing more about what Kwiatkowski’s goals were. If he had been on the wheel over the top, I’d bet the three of them (Cancellara, Thomas, Vanmarcke) could had a chance of running Sagan down. But he wasn’t. So, it really doesn’t make much sense for him to say what he did, IMO. He just would have blown up sooner. If you are suggesting seriously that Sagan had a choice to sit up or ride on with an 18-second gap and 13km to the finish in a Monument then one thing is absolutely clear – Michael is a poor tactician. Tristan, I may be a poor tactician, but I was watching on Eurosport France, with Jacky Durand commentating. Durand, who has actually won this race, seemed to think it was a possibility at the time. To be sure, he won it with a super-long range attack, but his knowledge of racing situations might be a bit better than yours. Tristan – I disagree, at that point in the race, Sagan had a huge decision to make. And think of it this way – until Sunday, Sagan’s never outstripped Cancellara over a 13km stretch in his life. Prior to Sunday, Cancellara’s track record for 10km+ efforts was far superior to Sagan’s. So, 95% of the cycling community would have given Sagan a pass if he sat up, waited for the other two, and then traded turns or even sat on Cancellara’s wheel until the finale. It would’ve been in Cancellara’s interest to keep the pressure on and not let anyone else come back because Cancellara traditionally can’t sprint very well. However, in hindsight, Sagan proved he now has a massive engine too. What a beast. Fantastic race, you have to love the Ronde. No arguments about a worthy winner, not that Flanders ever seems to throw up a dud. When you look at Sagan’s results this year -2nd at Omloop, taken out when about to contest the sprint at Milan-Sanremo, 2nd at E3, won Gent-Wevlegem and now he’s won this, you can’t really look past him for Paris-Roubaix. I’d expect him to to ride away from everyone else. If he entered Amstel Gold could you see anyone sticking with him up the Cauberg? What a talent, he’s definitely at his best when he just leaves everyone for dead from a distance. It takes the tactical nuances of a sprint out of the equation. Sagan achieved the rare feat of winning De Ronde in the rainbow jersey, the only men to have done so are Tom Boonen (2006), Eddy Merckx (1975), Rik Van Looy (1962) and Louison Bobet (1955). Rare company, indeed. So many riders get the rainbow stripes and for the next season have a another team’s lieutenant glued to the wheel. Nice to see the rainbow jersey defended so well. a 20% slope is hard any day but after 210km tougher and than add and THEN. How good was Evriti’s ride – I’d say phenomenal, I think he is only 22. What? Erviti is 32 and Spanish. For all Sagan’s second places and near misses (both this year and last), his palmarès are already incredibly impressive — four green jerseys at the Tour (4/4 from his first four attempts), eight grand tour stages, the Road World Championship, and now the Ronde. Not to mention other smaller victories, e.g. his overall win at the Tour of California. He is still only 26 and has a huge amount of time left to add a bit more tactical nouse / find a stronger team. Let’s not forget that Cancellara was only marginally younger (25) when he won his first monument (Paris Roubaix in 2006) and didn’t win the Ronde until 2010. I suspect that when Sagan’s career is done, he will have quite a few monument wins to his name. His win yesterday was the best performance I’ve seen from him yet — he left the field in his wake and didn’t look back, a move that took bravery, grit, and sheer talent. Such a great race! Agree with the sentiments, a great race and a quality write-up. Cancellara’s acceleration on Kwaremont where he pulled out of the line and past them was thrilling and had us joking about him using the same motor he had in 2010. I also loved watching the massive sprinter’s bulk that is Griepel going all gung-ho and attacking on the climbs for as long as he could. As Tomski said, Vanmarke not making a sprint for second and allowing Cancellara to roll in saluting the crowds was classy (and Cancellara acknowledged it with a small wave back). Even Sagan’s wheelie showed he’s matured – give the photographers what they want, but after crossing the finishing line with a more appropriate and respectful salute. Was nice to see Sporza cutting to the women’s race to at key moments, rather than just the last 20 seconds. If you’re Cancellara and you know that you and Sagan are the top two riders in the race, you chase any break he is in. Do that immediately – when Devolder gives up – and it’s a short chase. And once Vanmarcke went, you definitely go with him and work together to catch Sagan and Kwiatkowski (who had already shown at E3 that they could do this). Yes, Sky could then counter the move, but Cancellara doesn’t have to go with that move – unless Sagan goes with it – because, with Sagan in all likelihood, he can bring that move back. One of the favourites let the other favourite go up the road with two strong riders – and Astana, Katusha and Etixx-Quickstep were never likely to be that helpful in bringing them back. I was shouting at him to do this at the time – so much so that I almost missed Carlton Kirby telling me for the fifth time that Greipel could stay ahead on the Kwaremont and Paterberg, and win this. You’re joking, right? No commentator could think, even less say it out loud, that Gorilla Greipel could stay away for the win. Just think a few weeks back or think back to last year: Yes, Sagan was always strong, mostly in the mix, but winning – not so much. I think the riders, just like us, have to adjust to this “new/old” Sagan (old, because he used to win races like this). Maybe it is a neverending cycle: With every time Sagan is able to win again, he will be marked ever more, until he is so much marked, that he can’t win. I think it is often underestimated how much it costs, emotionally and physically, to be the marked man. In this race it surely was Cancellara everybody looked to, before everybody else. Kirby could – and did so a number of times. 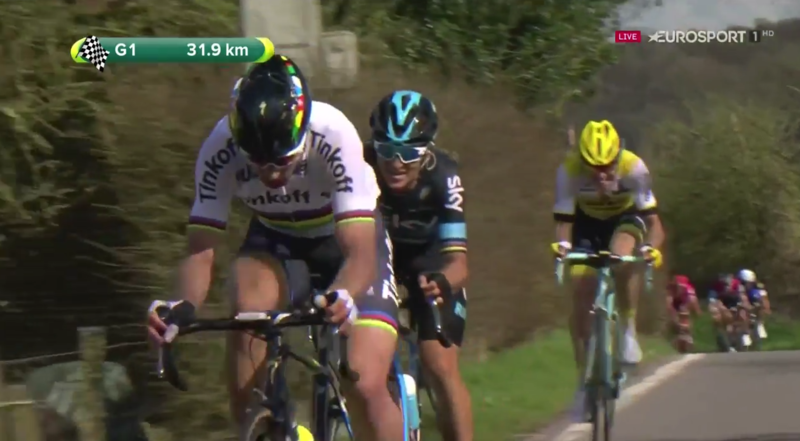 For instance, as Cancellara appeared not far behind Sagan et al on the Kwaremont, Kirby was shrieking hysterically about Greipel having been dropped. He invents a narrative in his head, then this becomes an established reality for him. He does this all the time: it’s one of the many things that makes him so appalling a commentator – not to mention laughing at his own dismal jokes, not concentrating on what is actually happening because he’s too busy jabbering away, providing no useful information and inflicting on us an endless onslaught of ridiculous sayings: ‘they’re rocking and rolling with it’, ‘puppy paws’, ‘joining the party’, ‘they’re having fun with it’, ‘it’s quality’, and a variety of people being ‘in the house’ – a saying I had hoped had died in 1993. HAHA – what?!? He was calling on Greipel to do well? Does anyone have any youtube links that a Canadian can watch to get an example of this?? I want to hear this. There has been some hand-wringing (http://velonews.competitor.com/2016/04/news/didnt-cancellara-follow_400855) over Cancellara’s failure to follow or later bridge to this key move, but it seems unlikely he would have done better than second place, regardless. Had he been with Sagan, he would have had to either drop him or beat him in a sprint. As I’ve written somewhere below, it is too easy to assume that if Cancellara had followed Sagan (or Vanmarcke), it would’ve been him against Sagan in the end. I agree that he did a mistake, but if he had followed at this decisive moment it is very likely that it wouldn’t have been a decisve moment at all. Hence, it is too easy to conclude that he would’ve been second regardless. If that first attack was neutralized by a bunch of riders following Cancellara, who knows what would happen? Good point, Idar. I agree. But doesn’t your comment go even further to support my main point, that the hand-wringing is unjustified? Thanks Inrng (and all) for the great coverage. Great write up – thanks Mr Ring. What is the collective noun for a “critical mass of urinators”? A leak perhaps. Great write up as usual, I though Sagan was sandbagging a bit when Kwiat made the initial move, it was almost like he was waiting to see if it would stick, only once Sep caught on did it seem that Sagan committed, for me that is the moment he chose to win the race. And finally, surely we can start a campaign to ride Eurosport of Carlton Kirby – he is not a cycling commentator, i’m not sure he even knows the sport – almost ruins the enjoyment of watching such a great race. Kirby missed the key move of the race yesterday (see above) while he was wittering on about Greipel, who was not relevant to what was being shown on screen – it was nearly a minute later when he picked up on the fact that three of the favourites had broken away. Really, really poor. His anecdotes and one liners can be good, but if you can’t commentate properly or have an understanding of team strategy and the tone of the race, then you simply shouldn’t be there. And if he says so and so is “in the house” one more time, I swear I will throw something at the TV. Watch it via Sporza then, as we do in “our” house. Between your understanding of the sport, their knowledge of and commitment to cycling, and the repetition of key words and phrases – many of which are not a million miles away from English, especially and obviously those that have come down from Old English – that working understanding could come a lot quicker than you might think. I switch to the Belgian coverage during Eurosport’s adverts (the picture’s too poor to do so at all times) and I learn more what’s going on from them despite not speaking a word of Flemish – because they’re telling you who the riders are. I watched most of yesterday’s Basque stage with the sound down – if they had the technology telling us who riders were in breaks (would be so useful in a break like this) I’d be free of him. I always download the Sporza broadcast, while I don’t understand much, still, I feel the commentators know their stuff. And no commercials, that’s a bonus. Rob Hatch for me is the best of the current Eurosport lot. Seems to know his stuff and doesn’t annoy me. I agree – him with Sean Kelly and/or Matt Stephens as lead commentator are by far and away the best combination. Totally agree – Kirby drives me mad, I often end up muting the volume if he’s commentating. Rob Hatch is excellent, I do not understand why Eurosport persist in using that buffoon Kirby. Could it be better? Always. I’m watching Flanders and other races live from thousands of miles afar. You know what’s worse than bad commentary? No live video. I felt fortunate watching the race and fear much complaining. Ahhhh so that’s the much-dreaded Kirby is it? I should have guessed. I don’t often watch Eurosport coverage, so I wasn’t sure, but I picked up on what you mentioned too and it struck me as pretty shoddy commentary not to notice the big move. I do feel a bit bad moaning about the guy, but yesterday he definitely detracted from the viewing experience by missing moves entirely, not bothering / being unable to let viewers know who was in each group ( getting it totally wrong about where Cance was for about 20 minutes during a key phase of the race when Etixx had the hammer down) and generally not having anything useful to say. The pairing with Kelly is a bad idea IMO, as both are anecdote driven speakers and more time reminiscing on races / events past than following the bunch. Agree that Hatch, Backstedt, Stephens etc. are better. I’d like to see David Millar in the booth again, after his excellent performance at the 2012 world champs for the BBC. On a side note – I’ve watched a few races on the cyclinghubs pirate feed, and the guy who runs the feed has been giving some amateur commentary at the beginning of races before full coverage starts ( and although he admits to being a novice, he’s really rather good). Perhaps there’s a market for the ‘pirate commentary’ ( ARHHH MATEY!) – would certainly pay for a feed of Mr Ring or Cosmo doing the commentary over a race. Excellent commentary in Australia from Matt Keenan and Robbie McEwen, you could tell that Robbie knew every twist of the course and they always kept their eye on the main moves. There was a couple of times I was shouting at Kirby to shut up, espcially when the key move of the race passed him buy. He just whittles on constantly about certain favourites he has. Yesterday it was Edvald Boassan Hagen. In one race, I think it was Tirreno-Adriatico, he spent a week banging on about how ‘Eddie Boss’ was going to be leading Reinhardt Janse van Renseberg out at Milan-Sanremo to pay him back for his domestique work that week. The fact that doesn’t make sense on any level didn’t seem to bother him. I started to genuinely dislike Louis Mentjes during the Vuelta last year he went on about him so much. And they are just the tip of the iceberg. Oh, and the word ‘engage’. So and so is really ‘engaging’ in this chase, or might engage in the sprint. What does that even mean?! Any combination of Kelly, Rob Hatch, Declan Quigley, Matt Stephens, Magnus Backstedt or anyone else anyone cares to mention would be better than him. I actually rather like Kirby, but he surpassed himself when he declared, seemingly at random with about 2 kn to go, that Sagan was now the favourite for the gold medal at the Olympic road race – which is three months away and on a course that doesn’t suit him. I urge you all to complain to Eurosport. By protected man you’ll be meaning “chosen son” – which seems to be CK’s go to phrase. I feel like I’ve opened a floodgate of emotion here. Need some kind of support group. E mail them and complain – I do every couple of months (lucky them), but if many do, they might just listen. I think Cancellara did nothing wrong. There was a spot on Kwaremont when he was less than 10 seconds behind Sagan/Vanmarcke. But the gap grew to 12seconds at the turn onto the wide downhill. He was just not strong enough to get back to Sagan, that’s all. It was a fantastic finale with classy riders. Worthy of the 100th edition! I think Spartacus blew it (and he said so as well) when he failed to jump on the move when Sagan left. The energy he used up in getting back up there might have been put to better use running down the fleeing Sagan later…but that’s the way it goes. Bring on the Hell of the North and a rematch!! Maybe with Boonen in there too, but he’s looking too skinny compared to his best years – lacking power? Bicisport has a report on Sonny Colbrelli’s weight loss program – kgs went down, but so did watts, watts per kg is actually better for him now with a few extra kgs. Hugely enjoyed the race, as usual. I thought Cancellara slipped up by failing to go with the Sagan move – though ultimately if they had crested the final Paterberg together, Sagan had it made anyway. It’s ‘proper’ that Sagan won it ahead of Cancellara. Passing the baton. And perfectly illustrated by Sagan breaking Vanmarcke on the Paterberg in exactly the same way and almost exactly the same place as Cancellara broke him a couple of years ago. Finally – Chapeau to Armitstead for winning the women’s race: it’s almost as difficult for her to get a win as Sagan, but she’s got four already this year. Yes, great end to the women’s race too. Well done Armitstead. Forced to open the sprint in first position. Emma seems to find it very hard to play it cool in these situations. Rightly placed herself on Armitstead’s wheel, but in the end she went way too early. ‘As the minutes went by Cancellara began to look like a passenger in a taxi stuck in traffic knowing he was going to be late for a meeting while being forced to watch the meter rack up.’ – what a wonderful image and anybody who has raced will know how this feels. After the World’s I thought the jersey would free Sagan, that he would be prepared to lose than tow others to the line. But this solo win is something else. A fantastic race befitting the 100th status. Great race, great review. A lot of moments to reflect on in hindsight. What if GVA didn’t crash? Easy to picture him with Sagan or with Cancellara/Vanmarcke in the end – two game-changing scenarios. What if Cancellara followed Kwiatkowski, Sagan and Vanmarcke? Equally easy to picture him with Sagan in the end, in a perhaps more likely scenario the attack would’ve been neutralized by the number of riders shadowing Cancellara? Still easy, for me at least, to picture him there in the final. Congratulations to Sagan on a deserved win. Part of me was rooting for Cancellara, he was in form and it was his last chance. When Kwiatkowski and Sagan went away, I felt for Cancellara it was risky either way, to go with them or to stay put. When Vanmarcke began to bridge across, it seemed the balance had tipped and it was the moment to latch onto Vanmarcke. I felt the most realistic chance Cancellara had was to be in this group and hope to be able to drop them on the Paterberg. In the end it looked like dropping Sagan on the climb would have been unlikely, and beating him in the sprint even less likely. Fantastic time trialling by Sagan in the last few kilometres to stay away. And a note to those mentioning Eurosport and Carlton Kirby – not to try to reduce the enjoyment of the event with this lamentable side, but – I can see how it does make the event less pleasing to watch. The endless string of misguided assumptions about what riders are thinking or aiming to do or might be capable of doing, detracts from the race. I have written to Eurosport some time ago, as it seems others share the view that he is not right for the position. I guess his employers disagree. I was very disappointed when the commentary was handed over to him near the top of the show. Poor Sean Kelly had to sidestep many comments, trying to give credence to the current or predicted movements of the race, it’s a difficult thing to do without outright contradicting the preceding nonsense from Kirby. Kelly must have very high tolerance and a good patience! Mind you, he can also spin a good tale – the last 10km of the commentary when they were both waxing lyrical about Sagan the rockstar springs to mind. all fizzled out again when the real action started though. Ok performance, but never threatened in reality. Great review and a great race to watch, many riders looking totally cream crackered, just shows how hard it is to “race” at this level and in the given terrain. Tremendous win by Sagan, he is maturing into a very nice Champion, not something I though a couple of years ago I must admit. Next year may see him leading Trek or will it be Ettix?? Not Trek, they have Edward Theuns and Jesper Styven for the cobbled classics next year. Styven was a beast in KBK a few weeks ago, rode off the from of the peloton and made it stick. I know Trek were looking at and gave up on Nibali but I doubt they could afford Sagan even with Cancellara’s salary coming off the books. I think only Sky, BMC, Astana and maybe Etixx (if Boonen leaves) could afford Sagan. I think Sky would pass, after the failed Yellow and Green assault with Cav and Brad, I don’t think they would be able to support Sagan and Froome In the TdF. BMC to let Gilbert go, maybe that could release enough money to bring Peter in, Gilbert looked like he’s best seasons were past him last year. I agree with a comment I saw else where. With Sagan’s quality I could see him winning all the monuments baring maybe Lombardia. Amstel Gold looks right up his street with a decent support team. But Trek have a new new sponsor onboard. And giving – seemingly – up so easily on Nibali maybe means they have another plan. All respect to the Trek riders you mentioned, but Sagan is a totally different thing on so many levels. I think Sagan’s not really worried where he will ride as long as his older brother comes too. I don’t think Segafredo will be too please with their sponsorship money being spent on Sagan when they apparently wanted an Italian, and judging by the size of the CA logo on the jerseys yesterday I doubt they are bringing Sagan money to the party. Your right though, Sagan is a different gravy altogether. Sagan might have a tougher time with L-B-L. It’ll be interesting to see what develops with the new petrodollar team rumored to be after Nibali. If the petrodollars don’t run out first, they could be in the market to buy Sagan as well? Weren’t they both with the old Liquigas team at one point? Absolutely, would be interesting to see Sagan and Nibali together again – could make it a new Liquigas, except it won’t be “Liqui” Gas, it’ll be “LiqUAEgas”, for United Arab Emirates. Ok, that was terrible, but yes they were teammates and that was a really good team. They did a great job developing Sagan and Nibali, too bad the team couldn’t see the results of their hard work on these guys. If Lombardia goes on switching courses, one out of two (the Bergamo finish) could be absolutely feasible for Sagan. He threw in some good performances on the occasional long climb in the past. We need to see the new climb in Liège to say something more about the Doyenne: as it was in the last editions I think it could be fine for Sagan from a technical POV, although quite hard in terms of team tactics. 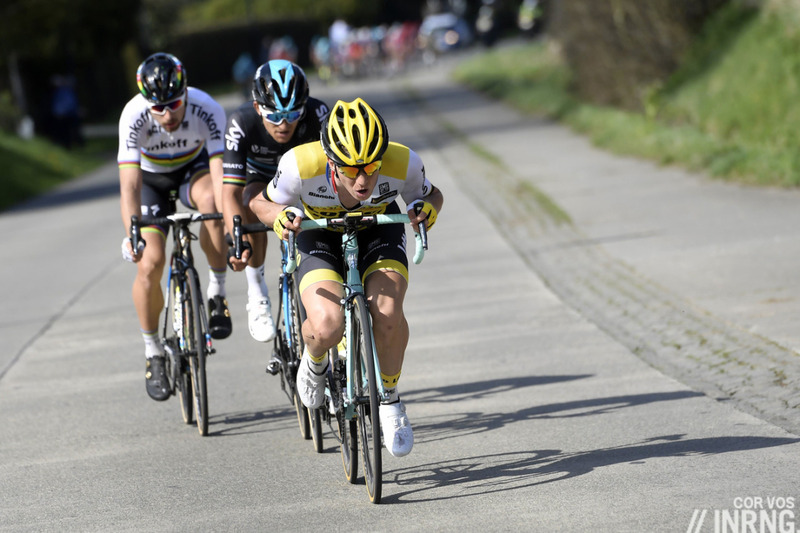 Great article Inrng and great job calling the performances of Cancellara, Sagan and Vanmarcke. Sagan was brilliant, and I would really argue that even if Fabian followed Sagan, the result would’ve been the same. Sagan was way too strong today for Fabian to drop him at any point and Sagan is too fast in the sprint. The fact that Sagan kept the gap on the final 10-12km run to the finish line proves that Sagan’s becoming an unreal powerhouse. There was no way for Sagan to fake that and Cancellara was giving it his all. Great job for Sep Vanmarcke too, last year was really disappointing for him and he rode a great race this eyar, especially to come back from mechanical issues early on. It’s sad that the Belgian Classics are almost over for another season. Who’s going to win Scheldeprijs?? Sagan will go to that new Bahrain team with Nibali. Why? For the money, …and he’s comfortable speaking Italian! Hope Spartacus takes P-R this weekend. Vai! Vai! The Sagan to Trek question was posed on Cycling Weekly Online! I should have quoted the source above, sorry. Masterful write up, inrng, but just one small thing to correct (if that’s okay): I think you’ve overnegated yourself with ‘wasn’t hardly a prize catch’, where you presumably mean ‘was hardly a prize catch’. Thank you for the articles! Thanks and, as ever, corrections are welcome. Think of it as a help for the next reader. I was wondering if Sagan might be the first to double Flanders and Roubaix while wearing the rainbow stripes, hoping we might be on the cusp of some serious cycling history. No. Rick Van Looy won the stripes at the end of 1961 and doubled in the stripes in 1962. He’s the only one. Boonen, in 2005, became the only rider to double Flanders and Roubaix and then become world champion. All three in the same year. But, there is hope. Sagan could make some truly unique history by doubling in the rainbow stripes and then winning the WC again in Qatar. Has anyone done the treble in rainbow stripes? Great write up of a great race. But this is a hard race to broadcast well; it’s so easy to miss the key moves. In contrast its much easier to follow the story of the race at Paris-Roubaix. The more open terrain helps in this regard. Dimitri Claeys (Wanty-Groupe Gobert) put in a heroic performance for the team finishing 9th in a very hard week for the team. Chapeau to him. My take is that the recruitment of Oscar Gatto has helped Sagan tremendously. Contador too in showing how to gain friends in the peloton. E3 differed from Gent and RVV in that Gatto was separated from Sagan. When previously he’d have to help pull back a rider such as Stannard, now he sat back while Gatto alternated with Trek. When Stannard was caught, Gatto is still alternatating at the head with Trek. Sagan has the luxury of then chatting to Kwiatkowski looking at first to try to get Sky to help with the pace setting, but look closely. The chat is back and forth between the two, at this stage. Then immediately afterwards Kwiatkowski goes and only Sagan follows. All the time Gatto was pace setting. A risky attack yes, but both knew from E3 that together they had kept the other bigs away and tried it again. Having a teammate helping set the pace allows for the leader to draw breath and plan strategies. Gatto has been superb for Sagan and separating him from Sagan is a tactic to winning P-R.
Great race, as Flanders usually is. Well done, yet again, Inner Ring. Sneaky drive by on Pozzato there Mr Inner Ring. I once again rode the full sportive the day before (as many of you guys have i suspect) and my admiration for these Guys / Gals athletes/superstars shoots through the roof! The short route ONCE was enough for me! But as you said, riding this course, even a small part of it gives one new insight on how hard this sport is. Same with riding any of the famous climbs that just don’t look so tough on TV. Get out there and ride ’em!! As to “long live the King” I’ll wait until Sagan’s won a few more before I’ll call him king of anything – except maybe the wheelie? I’m ready to hand him the crown there – that post-race wheelie was great, right up there with Alfredo Binda blowing a few notes on a trumpet after winning a race!! From a Dutch perspective I liked the Dylan van Baarle rode and finished (6). At the risk of being negative, and to caveat my comments with a chapeau to Sagan for a great win, I have a nagging feeling that this may not be the dawn of the Sagan era after all. Could this actually be a case of contract being up at the end of the season, so he’s pulling out all the stops now, but once he pockets his multi million pound contract then he’ll go back to half trying and failing for a few years? It wouldn’t be the first case in cycling of riders performing in their final year. Obviously this will only be proved in a few years, and therefore another apology for a negative post. I guess it’s my attempt at tempering any over-excitement at a dawn of a new era, with a note of caution that this win needs to be backed up. I really can’t endorse your assumption that Sagan has ‘half trying’ the past few seasons. He has been on the podium too many times to remember so he has clearly been ‘at the races’ but not tactically. Whilst he will still have to work hard to win races to think he hasn’t bothered until now is a bit naive? Apologies, that’s poor wording on my part. It’s not that I don’t think he’s been bothered before, but perhaps the end of the contract has given him an added impetus that was lacking before, and he will revert back to a more relaxed manner? I guess what I’m thinking is that in a few years time we may look back on Sagan’s career, and see big wins mirroring end of contracts, whereas for Cancellara and Boonen they have won year in, year out (barring injuries). Even if “big wins mirroring end of contracts” proves to be true, on what basis could you conclude on any correlation? I don’t think Sagan can ever be accused of “half-trying”, if nothing then he can be accused of over-trying in almost every race he is part of. Winning races is as much about being “ready to lose” so that you give everything to these all-or-nothing moves that mean finishing either 1st or 21st. E.g. Degenkolb last year at P-R. I would venture that Kristoff is in the “half-trying” saloon, he acknowledged last year that he couldn’t wait for a bunch sprint and took the race by the scruff with a risky move a la Sagan. This season he appears to be the default sprinter-in-waiting whilst there others go up the road. Kristoff has been in good form this year, not exceptional like last year. So he has reverted back to where he’s always strong: Sprinting after 250 km +. That’s what netted him Sanremo and the 2012 olympic bronze. Wonderful writeup, inrng. Makes images. I concur. Like Boonen or Merckx, Sagan genuinely seems like one of these racers who “likes to race”, not just a racer who “likes to win” (Lance, anyone? ), or worse a racer who likes to be a “star on a pro bike team.” In other words, he fully accepts the flipside of trying to win, which is to lose and end up second or worse. In an interview with Sporza yesterday, he alluded that he doesn’t expect that his 2nd places will all at sudden go away. He reminded the interviewer (who imho was not doing a very good job and sounded more like a star-struck music reporter interviewing one of his idols) that winning any race is always hard and that he doesn’t expect it any different going forward. 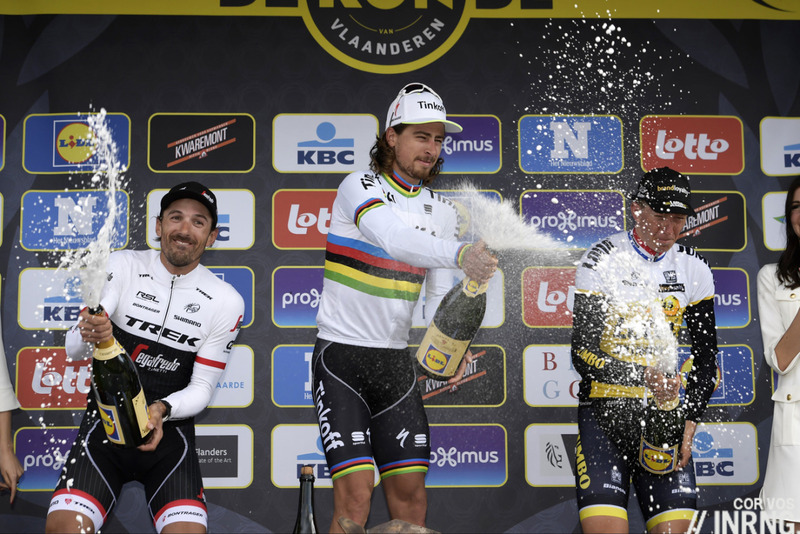 Ironically, it is that attitude that makes it more likely that Sagan will become even more dominant in one-day classics and join the select club of Museeuws, Boonens, Cancellaras and all the other great classic riders that came before them. Small typo at the end of the first paragraph I think; did you mean “going TO stay away”? Thank you for the write-up! Almost better than watching the race on TV. All has been said, I am just wondering why Cancellara will retire in the exceptional form he is in. I mean, he was passing much younger cyclists as if they were lampposts in the Ouse Kvaremont. If it was his last time, it was a beautiful thing to see. Why retire when he’s at the top of his game? Because he’s at the top of his game, it’s a good time to go out rather than have memories of him tarnished by disappointment. It’s also personal for him, he’s simply had enough of the training, travelling and more and wants time with his family. Too few know when to quit. Bernard Hinault is a guy I admire for the way he chose the end of his racing career and stuck to it. I’m thinking Boonen ought to join Cancellara in hanging up the wheels at the end of this season? There’s more to life than bike racing. Andrew Hood has a good rundown on Erviti on velonews. 12 seasons (all for the Movistar org), 38 “monument” starts (12 Rondes).